Deployment utility for Adobe Acrobat. Is there a better alternative to Adobe Customization Wizard XI? Is Adobe Customization Wizard XI really the best app in System category? 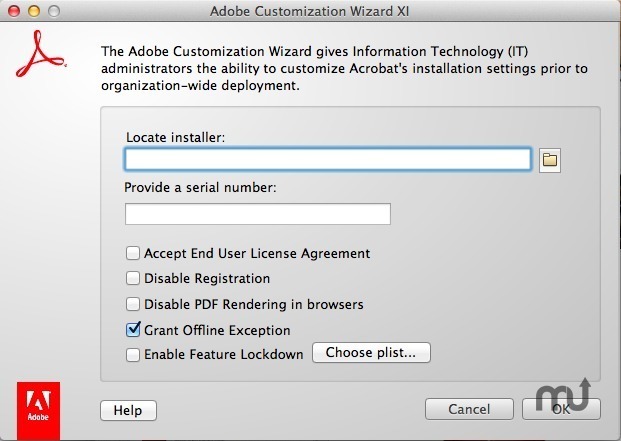 Will Adobe Customization Wizard XI work good on macOS 10.13.4? Adobe Customization Wizard XI for Macintosh is a free downloadable utility designed to help IT professionals take greater control of enterprise-wide deployments of Adobe® Acrobat® XI. With it you can customize the Acrobat installer and application features prior to deployment. The Wizard helps IT administrators modify the installer prior to deployment via a graphical user interface. Accept the EULA on behalf of your organization. Version 11.0.00: Release notes were unavailable when this listing was updated. Adobe Customization Wizard XI needs a review. Be the first to review this app and get the discussion started! Adobe Customization Wizard XI needs a rating. Be the first to rate this app and get the discussion started! Lock features so that end user can't change them.